A Politician Turned General offers a critical examination of the turbulent early political career and the controversial military service of Stephen Augustus Hurlbut, an Illinois Whig, Republican politician, and Northern political general who rose to distinction as a prominent member of the Union high command in the West during the Civil War. This first biography of Hurlbut chronicles the early life and the Civil War career of one of Abraham Lincoln’s foremost military appointments. 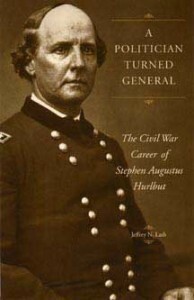 Through exhaustive research of primary and secondary sources, author Jeffrey N. Lash identifies and evaluates the successes and failures of Hurlbut’s generalship and combat leadership, both as field commander in Missouri in 1861 and as a division commander at the Battles of Shiloh and Hatchie Bridge in 1862.